Company Shops was the name given to the community that developed around the array of repair shops built for the maintenance and construction of the North Carolina Railroad's rolling stock. The shops were built between 1855 and 1859 on land purchased by the railroad in Alamance County, between Graham and Gibsonville. In an attempt to promote the sale of town lots, the directors of the railroad changed the village's rather unromantic name to "Vance" for a period between 1863 and 1864, though in July 1864 they voted to resume calling it Company Shops. Chartered in 1849 and completed in 1856, the North Carolina Railroad followed a crescent-shaped route from Goldsboro through Raleigh, Durham, Hillsborough, Greensboro, and Salisbury to Charlotte. In August 1853 its directors voted to construct shops within five miles of the railway center, and the following May the company bought eight tracts of land totaling approximately 632 acres. The directors were committed to the concept of a company town characteristic of nineteenth-century industrial development; although the railway's construction covered less than 30 acres, the directors wanted the additional land to control development and ensure adequate police oversight of the community where their workers lived. Construction began in the summer of 1855, and by 1859 there were 57 buildings in the village. Seven shop structures were built: two engine or machine shops, a blacksmith shop, a foundry, a carpentry shop, an engine shed, and a car shed. Workmen in the shops were capable of completely rebuilding engines, constructing boxcars, and repairing all of the railroad's equipment. In addition to the shops, the workers erected a passenger and freight station, a two-story hotel, houses for workers, and three larger houses for railway officials, one of which served as company headquarters. During the Civil War, Company Shops remained a rustic village without churches or schools. Not until 1863 did stockholders approve the layout of streets and the sale of lots for private homes (lots to be used for commercial purposes could only be leased). The railroad placed a clause in all deeds and leases prohibiting the operation of "any house of ill fame, or house for the sale of spirituous or fermented liquors or for any species of gaming on said lot." The village was incorporated in 1866. 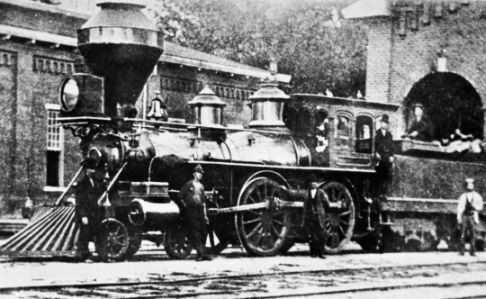 In 1871 the railroad was leased to the Richmond & Danville Railroad, which was acting as a proxy for the Pennsylvania Railroad; the latter company was rapidly building a system to link the Northeast with the Deep South. By 1893 the North Carolina Railroad was part of the Southern Railway system, which would build massive new shops at Spencer. After the lease to the Richmond & Danville, employment at Company Shops declined as jobs and workers were transferred to Richmond and Manchester. The inappropriateness of the name "Company Shops" and resentment toward the railroad led to a mass meeting on 1 Feb. 1887, when a committee was appointed to choose a new name for the town. A week later the state legislature acted on the request of the residents and changed the municipal charter to read "Burlington." The North Carolina Railroad sold the last of the shop area not used by the Southern Railway in 1921. Four shop buildings, modified by renovations and additions, have survived and are used for commercial purposes. Durward T. Stokes, Company Shops: The Town Built by a Railroad (1981). Burlington Company Shops in process of revitalization, 2003. Image courtesy of North Carolina Railroad Company annual report, NCDCR Digital Collections. Available from http://digital.ncdcr.gov/cdm4/document.php?CISOROOT=/p249901coll22&CISOPTR=286644&REC=1 (accessed July 5, 2012). Company Shops, Burlington, Alamance Co., c.1880 NCRR locomotive built by Pittsburgh Locomotive Works (from Crossties Through Carolina, p.72). Image courtesy of the State Archives of North Carolina, call #: N_74_10_3067. My great great Grandfather was on the committee to change the name from Company Shops to Burlington. His name was Dr. Richard Freeman. My Dad was named after him. This is what I believe to be factual, as my family has always told me. Also, after watching "Roots" years ago, if I did the math correctly, I believe Dr. Freeman was the town doctor at the same time that Chicken George's son was the blacksmith. If anyone knows if I have this right, please let me know! I'm proud of my family's history.